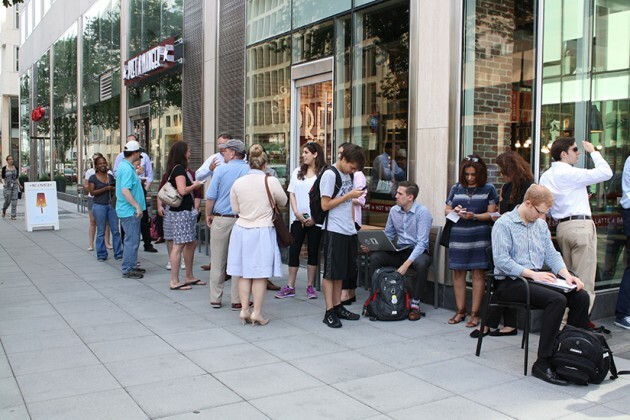 Dozens of locals have lined up to win a year’s supply of sandwiches. 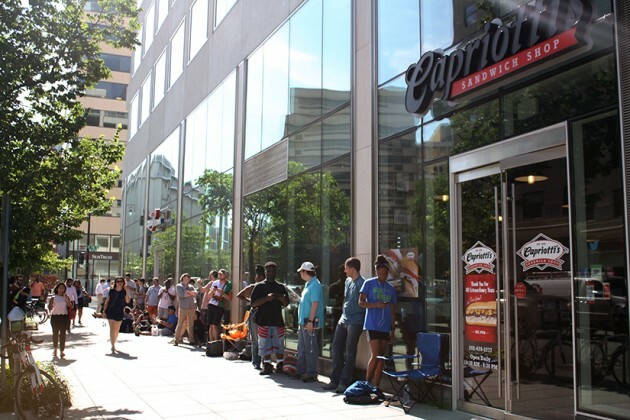 Capriotti’s, the Delaware-based sub chain at 1800 M St. NW, is celebrating the company’s 40th birthday today by slinging a voucher worth 52 Bobbie sandwiches to the first 100 customers who walk through the door. The Bobbie, a sandwich made with turkey, stuffing and cranberry sauce, is rumored to be among Vice President Joe Biden’s favorite sandwiches. Naturally, people began lining up at the store early this morning. Today’s primaries in New Jersey and California could give supporters of presidential candidate Hillary Clinton a reason to celebrate. 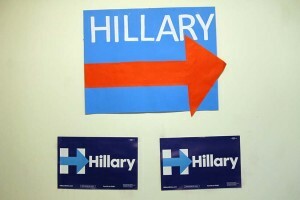 If all goes well, Clinton will further increase her grip on the the Democratic nomination (though the Associated Press reports that she already has it in the bag). 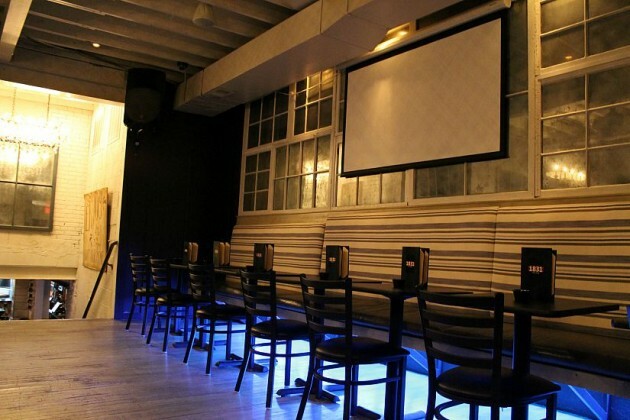 To help usher in the potentially good news, Mayor Muriel Bowser and local Hillary supporters will hold a primary results watch party at Sign of the Whale (1825 M St. NW) starting at 7 p.m. tonight. 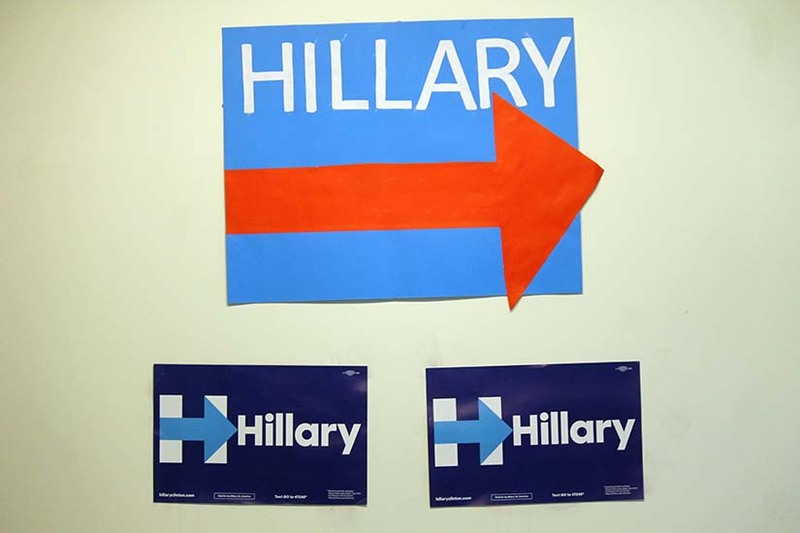 “Everyone will celebrate the hard work supporters, organizers and volunteers have put in across the country to get out the vote for Hillary Clinton and start the one-week countdown to the D.C. primary,” according to a press release. 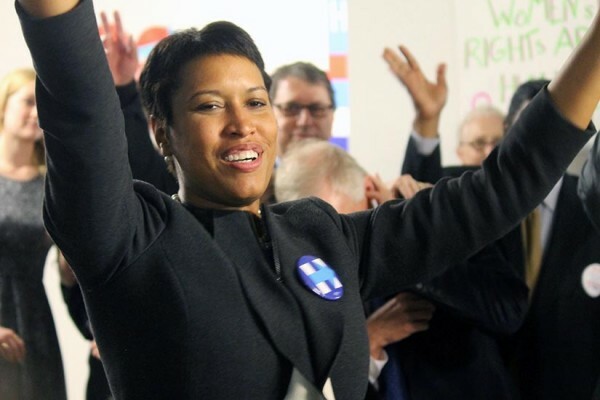 Mayor Bowser, an ardent Clinton supporter, will “discuss how Hillary Clinton is the right candidate to help break down barriers for families in Washington, DC and build ladders of opportunity,” the release continues. Those interested in attending the party are asked to RSVP online first. D.C. Mayor Muriel Bowser is #ReadyForHillary. Bowser, Ward 2 D.C. Councilmember Jack Evans and members of Hillary Clinton’s D.C. campaign staff celebrated last night during the opening of two new Clinton campaign offices located at 1919 M St. NW and 1227 Pennsylvania Ave. SE. During an appearance at the office on M Street, Bowser voiced strong words in support of the presidential candidate and former U.S. Secretary of State. Bowser also took some jabs at presumed GOP nominee Donald Trump. The Food Network star was spotted pulling up to Bub and Pop’s (1815 M St. NW) in a black Escalade around 2:25 p.m. today. 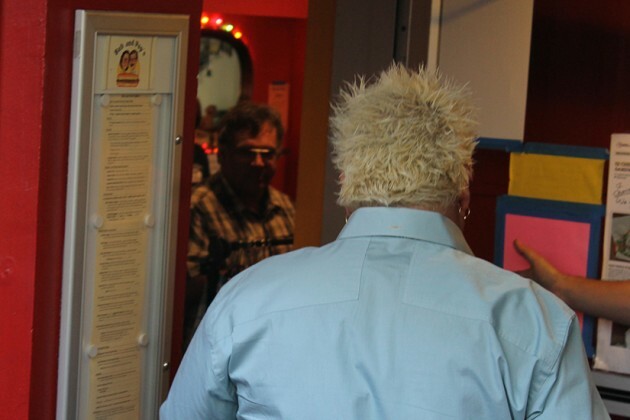 Dozens of people gathered to watch the spiky-haired food fan enter the restaurant. 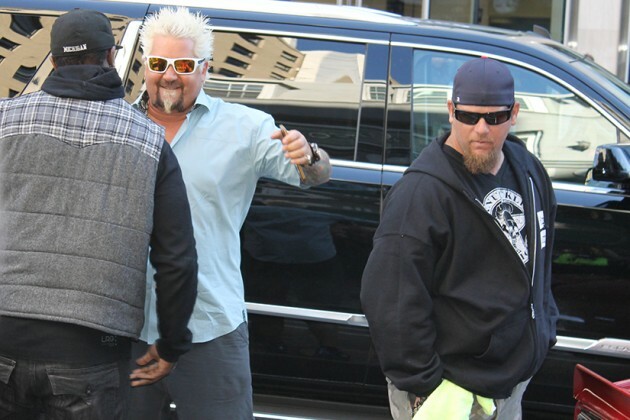 Fieri then waded through the crowd, stepped inside the eatery and disappeared from the public eye. While what he ate remains a mystery, plenty have speculated he’d chow down on a five-pound Lil Petey sandwich. 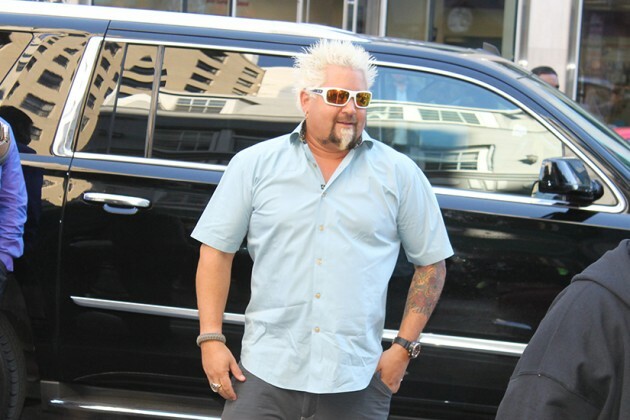 Fieri was also spotted earlier today at Toki Underground on H Street and in front of Carving Room downtown. 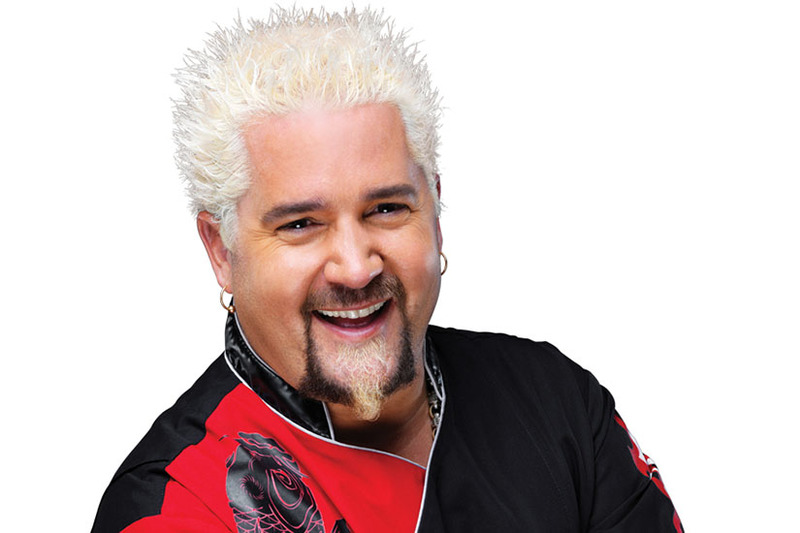 ALERT: Guy Fieri is coming to town. REPEAT: We are at level five Fieri. Where will Fieri be when he visits M Street? The answer to that question is … complicated. As it turns out, Fieri is kind of a hard guy to track. But that didn’t stop us from spending the whole day looking for him. 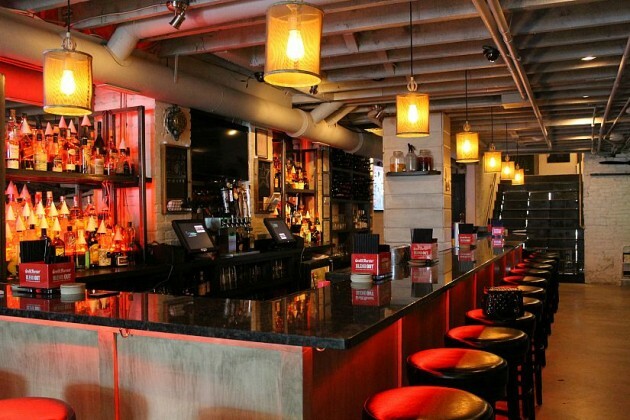 Here’s what we know: Fieri and crew will park along the 1800 block of M Street NW some time between the hours of 5 a.m. and 3 p.m. 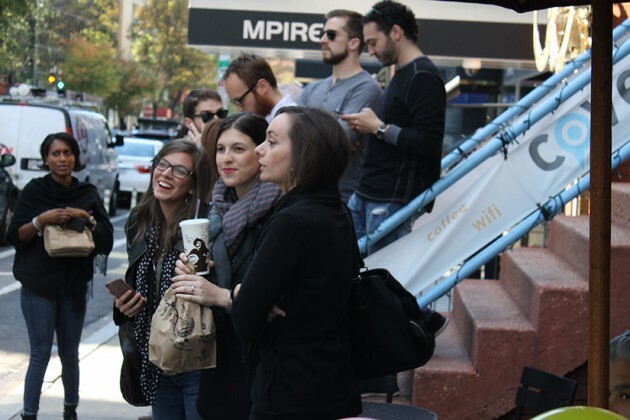 There are a handful of eateries along that block that appear to be logical destinations for a mucho-grande food fan, such as Bub and Pop’s (1815 M St. NW) or Sign of the Whale (1825 M St. NW). Likewise, Sign of the Whale marketing manager Kelly Harwood said she hadn’t heard anything about a potential visit from the baron of roast-beefy. Alright, so maybe he wants … soup? There’s a Soupergirl (1829 M St. NW) on that block. Maybe he’s trying to get healthy? But a visit to Soupergirl revealed nothing, though an employee behind the counter said he could “neither confirm nor deny a visit.” What about OKI Bowl and Sake Bar (1817 M St NW)? Nada. The employees there said they didn’t even know he was coming to town. What else is on the block? Chipotle, Capriotti’s, Qdoba are all chain restaurants, so they’re out. 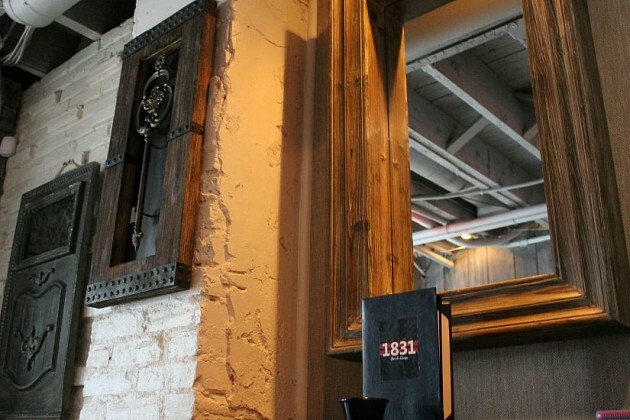 Could it be the new-ish steampunk bar 1831? We checked, and nope. MPire and Camelot, given their business models, seem unlikely. The employees at House of Kabob (1829 M St. NW) said they hadn’t heard anything. 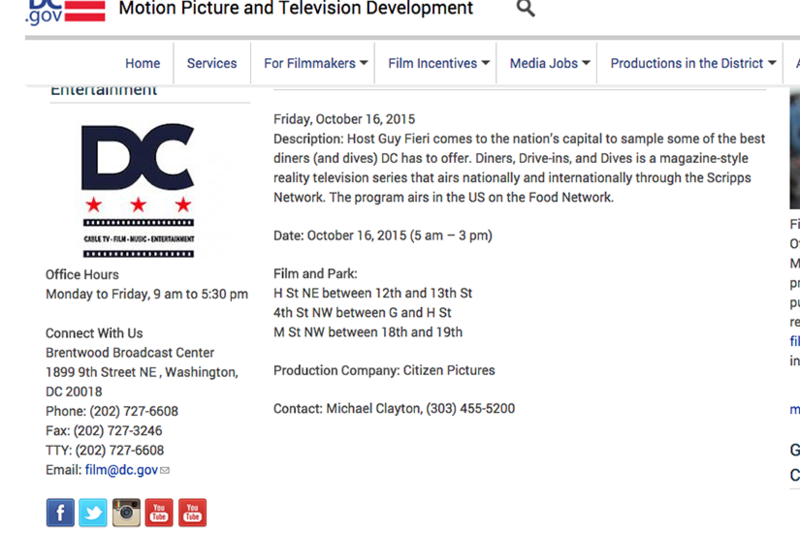 Could it be Parlay (1827 M St. NW) or Ozio (1813 M St. NW)? It’s possible, but likely a dead end like the rest — though we will admit both bars did not return our request for comment. It could also be that someone is lying to us. We just don’t know. 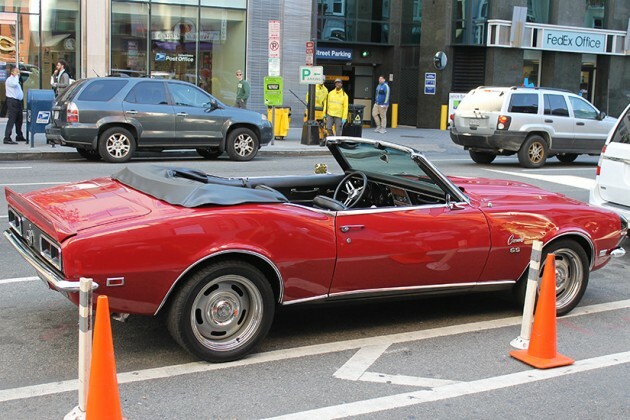 So, the hunt for Fieri’s red convertible continues. Let us know if you’ve seen or heard where he might be on Friday. If you do, there’s a box of microwave jalapeno poppers in it for you. We mean that. Several business near St. Matthew’s Cathedral are bracing for arrival of Pope Francis. 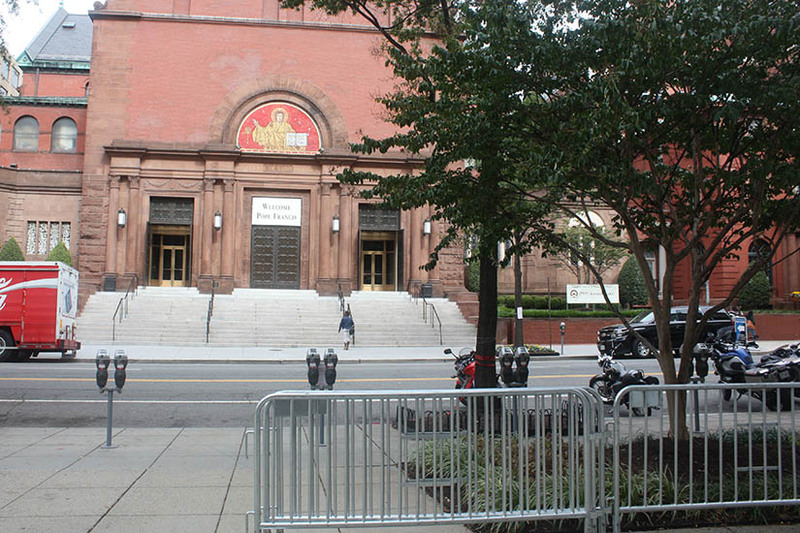 The pope will bring his entourage of road closures, beefed-up security and onlookers to the Dupont Circle area tomorrow morning as he visits with bishops at the Cathedral of St. Matthew the Apostle. The owners of several businesses that share the 1700 block of Rhode Island Avenue NW with the church are preparing for street closures and large crowds, but few are planning to close for the day. At Jack’s Fresh, a restaurant across the street from the cathedral, owner Susan Yin said that she plans to stay open tomorrow. Yin added that several customers have asked, noting that that eatery’s windows directly face the front steps of the cathedral. Customers may have to use the restaurant’s entrance on M Street NW if the Rhode Island Avenue entrance is blocked off. 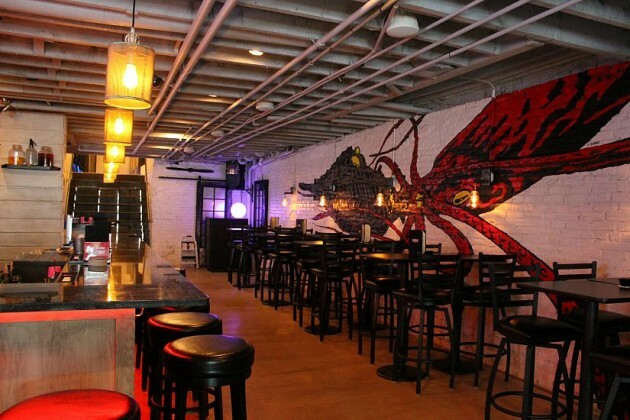 Yin added that had not heard specific directions from police on how the barricades that are already cropping up along Rhode Island Avenue will affect her restaurant, but she hopes at least one customer will be allowed through the store’s main Rhode Island Avenue. The owner of Marbi’s News Stand, which is next door to Jack’s Fresh, said he doesn’t expect customers to be able to reach his store from Rhode Island Avenue, but said his entrance within the OFC building will remain open. On the other side of the OFC building, on M Street, businesses aren’t dealing with as many physical barriers, but are still bracing for crowds and traffic problems. The owners of Suki Asia restaurant say that they will prepare boxed lunches ahead of time so they can better serve the expected crowds of pope-watchers. Across M Street, employees at Avis car rental say their storefront will remain open, but because there will be so many road closures in the area, they’re encouraging customers to go to their other locations at Union Station and National Airport. Mike Caruso, vice president of Caruso Florist on M Street NW says he’s not sure what to expect tomorrow. He expects crowds in the area around the pope’s visit but with so many people in the area working from home, he thinks the area might be empty for much of the afternoon. Caruso’s business provided several flower arrangements to the cathedral for their services, and he hopes that they help create a festive atmosphere in and outside of the church. But one thing the pope and his fans may not be able to do tomorrow is bank: Both the BB&T Bank location at the intersection of M Street NW and Rhode Island Avenue NW and the Sun Trust bank location at the intersection of M Street NW and Connecticut Avenue NW will be closed all day. In honor of Pope Francis’ upcoming trip to D.C., Rumors (1900 M St. NW) has added a sandwich professed to be his favorite. What does His Holiness like to eat? If the sandwich is any indication, the pope likes to pile chimichurri-marinated chicken breast, provolone cheese and arugula atop ciabatta rolls and top it off with a healthy scoop of “holy land” relish made with chopped tomato, cucumber, onions, shallots, parsley, garlic and lemon vinaigrette. Mike Soper, the menu consultant behind the ‘wich, said creating the divine delicacy was a unique culinary challenge. “We were just sitting around and thought, since the Pope’s coming and we’re right down the street from St. Matthew’s, let’s try something different,” Soper said. The recipe was inspired by Pope’s background, and incorporates Argentinian, Italian and Mediterranean culinary influences, said Soper. He added that it also reflects the current pope’s humble nature. Some of the proceeds from each sandwich sold will be donated to Catholic Charities to support its meals programs, Soper added. And the sandwich has already snagged some church cred: Soper said Rev. Daniel Gill and Monsignor Ronald Jameson of the Cathedral of St. Matthew the Apostle tried the sandwich and gave it their stamp of approval last week. The Local News Now staff here in the office also dug into the sandwich earlier today to see if it lived up to the holy hype. 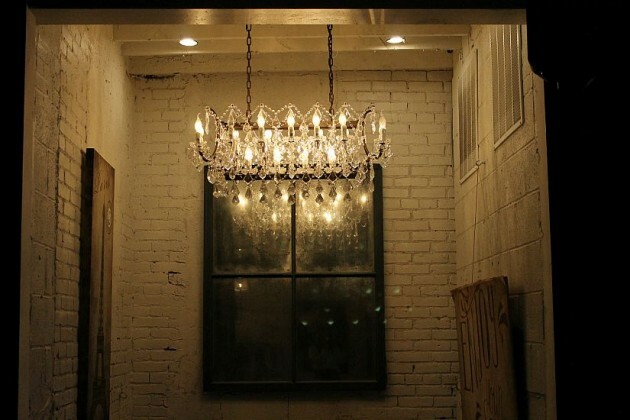 A steampunk-inspired bar and lounge is set to open on M Street in September. 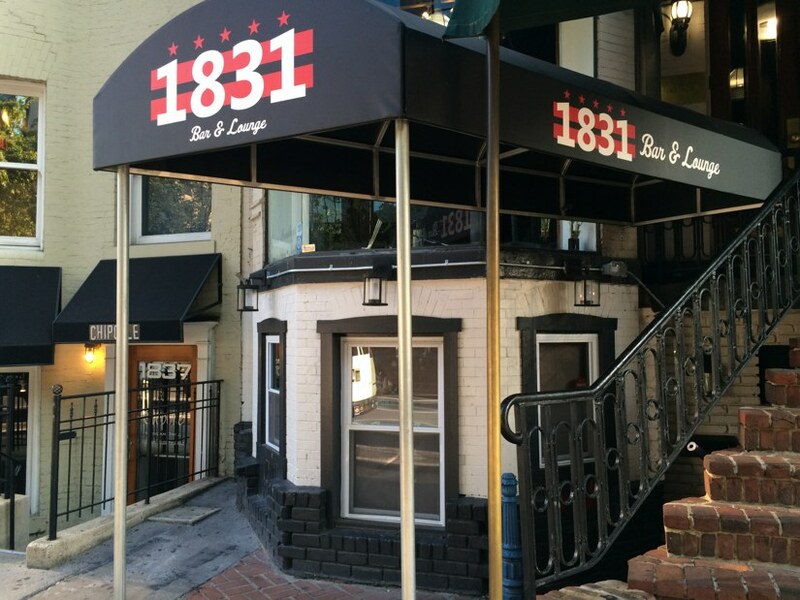 The bar — appropriately called 1831 — will be located in the former Second State space at 1831 M St. NW. The new hangout is the brainchild of brothers Jeff, Sean and Jean-Paul Chreky. Daniel Chreky, the brothers’ father, owns the building and operates Daniel’s Hair Salon on the upper level. Jeff Chreky, 24, said he and his brothers, 31 and 34, came up with the concept for the bar together, hoping to give diners a “classier” alternative to clubs and college bars. 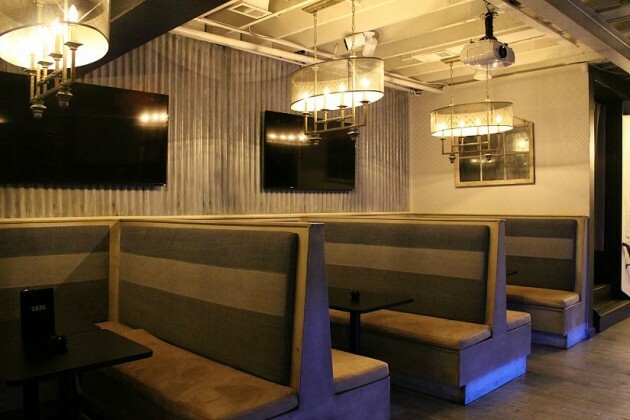 The lounge will serve small plates with salads, skewers and meat and cheese plates, Chreky says, and the bar will feature six taps and a wide selection of wine, beer, liquor and cocktails. Landmark Theatres will reopen West End Cinema (2301 M St NW) later this month, according to a sign recently posted on the theater’s window. New employees are currently being hired to prepare for a soft opening on July 17, an employee working at the former West End Cinema location said today. A Craigslist ad seeking part-time staffers was posted last week. 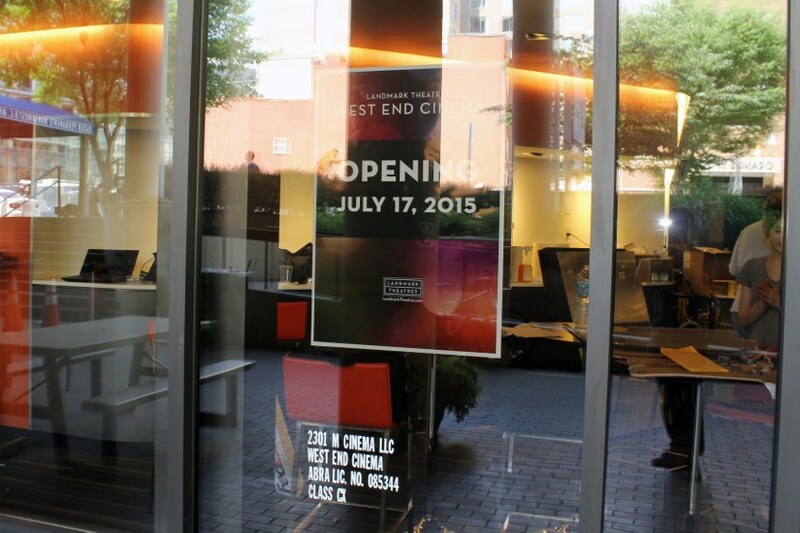 West End Cinema closed last March amid “significant increases” to occupancy costs, reported the Washington Post. Landmark Theatres is a national theater chain that owns the E Street Cinema downtown and the Bethesda Row Cinema in Bethesda. In addition to West End, the theater chain also plans to open a new theater in the Atlantic Plumbing Project development on V Street NW on October 9, as reported by the Washington Business Journal in November. Congregants of the Metropolitan African Methodist Episcopal (AME) Church (1518 M Street NW) led the citizens who came out in force last night (Wednesday), May 15, to urge that development of the planned M Street bicycle lane be stopped. The meeting was held at the West End Library, 1101 24th Street, by the District Department of Transportation (DDOT). Church members were joined in their objections by local businessmen concerned that the bike lanes would reduce their business, and citizens who felt that the project was a waste of taxpayer money. Supporters of the bike lane, although present, seemed smaller in number and less vocal at the meeting. The strong community feeling seemed to take Mike Goodno, Jim Sebastian, and Sam Zimbabwe, DDOT’s three presenters, by surprise. The audience sat quietly through most of the initial sideshow presentation, which described several studies about the traffic on the existing L Street bike lane and projected design of the M Street lane. Project Manager Goodno said that the installation of the bike segment would be installed over three weeks in August. After that, the meeting was dedicated to defending the M Street bike lane from suggestions that it be scrapped altogether. As a result, at least 20 of the 80 people attending the meeting seemed to be members or supporters of the Metropolitan AME Church. They said that the church had not been contacted. DDOT said that they had contacted someone at the church that morning. A claim that DDOT representatives had been to the church years previously to solicit comment were met with incredulity. One person asked, “Is it open for discussion that you will avoid the 1500 block [of M Street]?” DDOT indicated that it would be difficult or impossible to divert the bike lane around one particular block. A local businessman also spoke against the bike lanes. Another attendee told the businessman he was mistaken. “Bike trails will increase your business,” he said. One woman who identified herself as a bike rider and a DC resident said the community was frustrated but a compromise might be reached. At times the conversation was less the civil. DDOT was always polite to audience members, but sometimes audience members were not polite to each other. On three separate occasions, Zimbabwe had to threaten to stop the meeting altogether. After the meeting, one pro-bike audience member said that many pro-bike audience members had attended the meeting but had not contributed. She minimized the importance of the protest. “There are always people like that at these meetings,” she said. From Luis Gomez and Rachel Nania. 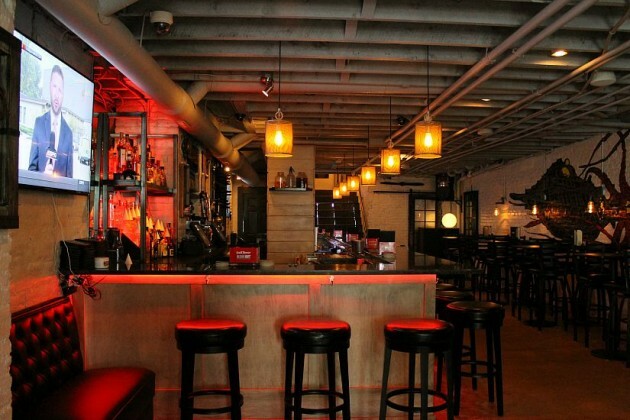 TakEATEasy, a new eatery at 1990 M Street NW, opens this Friday, February 8. And here’s the big news: the restaurant will be open from 11 am until 5 am. TakEATEasy is the latest venture from brothers Manuel and Juan “Nacho” Olivera and partners Jorge Mendez and Daniel Aquino. The Olivera brothers are well remembered for their neighborhood favorite, Fast Gourmet, at 14th and W Streets NW. The new restaurant will seat 49 people in a casual, diner-style space. Lunch offerings include gourmet sandwiches (Chivito and Cubano sandwiches are on the list), fresh salads and pastas. The dinner menu will rotate, and Nacho — who is in charge of the kitchen — will serve dishes inspired from French and Spanish cuisines. The bar menu includes tapas and a selection of two local draft beers, imported beers and domestic bottled beers. Specialty drinks, sangria and a selection of Argentine and Spanish wines will also be available; all alcohol will be served until midnight. 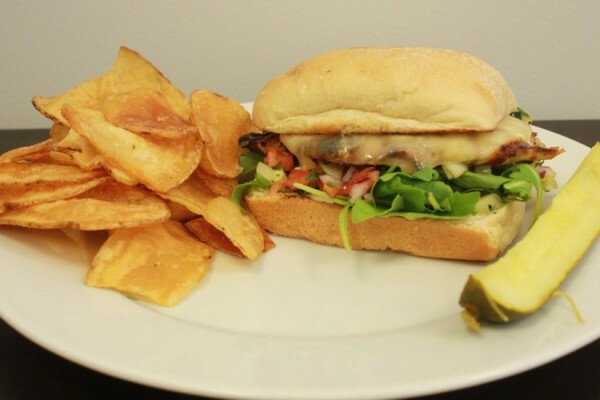 TakEATEasy’s late-night menu will offer gourmet sandwiches.